Come join the Information Professionals Social Club for our May meet-up at FIVE, in Berkeley. 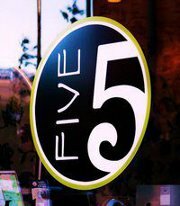 A Modern American Bistro & Bar, FIVE features a stylishly reinvented menu of familiar favorites. Please RSVP either to Stephanie Roach, Cyndi Varady, or on the Facebook event page, so we’ll know how many will join us. The IPSC’s mission is to promote networking between information professionals of all walks, this includes seasoned professionals, new graduates, and students. Our informal meet-ups are designed to stimulate conversation, share employment experiences and educational advice, and above all make new friends. Jupiter Cafe: 2181 Shattuck Ave., Berkeley, CA. Come celebrate summer with the Information Professionals Social Club! The IPSC invites Bay Area information professionals, students and alumni to join us at 7pm on May 24, 2011 for our next meet-up at Jupiter in Berkeley, CA. Jupiter, while out of this world in taste and ambiance, is located at 2181 Shattuck Avenue in Berkeley, CA. Join us on Facebook, where we share information on the profession, tips on interviewing and landing the job you want, and stories and news that touches the bookworm in all of us. The IPSC was founded by LIS Lady, Stephanie M. Roach, and Cynthia Varady.